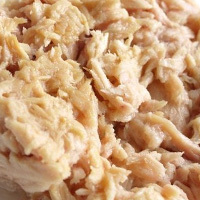 Canned albacore tuna in oil that when combined with mayonnaise to make a tuna sandwich amounts to a substantially large amount of calories. However, it does provide vitamin E. Other nutrition found in canned tuna in oil includes: vitamin D, niacin; and vitamin B12. The calories in Flaked White Tuna Oil Taste per 80g(1can) is 230 calories. Flaked White Tuna Oil Taste is calculated to be 288Cal per 100 grams making 80Cal equivalent to 27.78g with 18.88g of mostly fat、15.04g of protein、0.08g of carbohydrates in 80g while being rich in vitamins and minerals such as Vitamin E Alpha Tocopherol and Niacin.